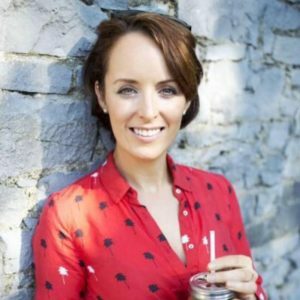 This week I’m really excited about introducing you all to another Irish Food Blogger, Frances Walsh from The Honest Project! We are doing a blog and recipe swap and you will be able to read my contribution to Frances’s blog over here. Hi Frances! Can you tell us something about yourself and your work? Sure! 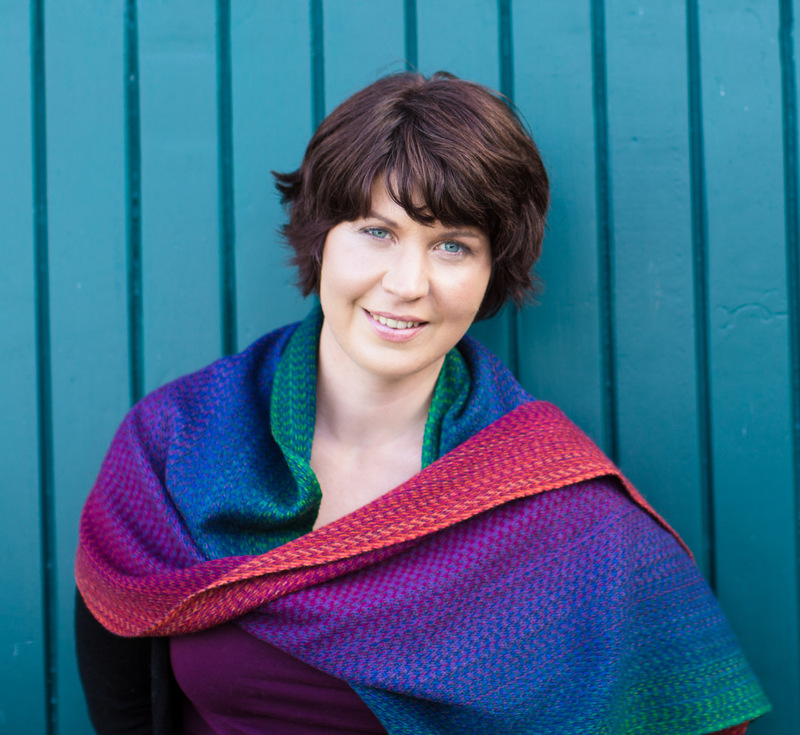 My name is Frances and I live in Kilkenny in the south east of Ireland. Kilkenny is my home town, but I lived in Dublin for years where I worked as a lawyer. I moved home about four years ago when I was diagnosed with cancer to focus on my recovery. I started my blog, The Honest Project two years ago as something for me to focus on when I was getting better. I found cooking food very therapeutic, especially when it was healthy foods. I began to experiment with my cooking and document it on the blog. I’ve been a vegetarian since I was a child but never really experimented with vegetarian cooking until I started my road to recovery. I also love writing and photography so the blog is a great way for me to spend time doing some of my favourite things. I won’t really call it a philosophy. I just cook and eat what I want to at a particular time. I guess my focus is on eating more vegetables and I find vegetarian cooking exciting. I’m always looking for new ways to add vegetables to my diet. I think everyone has to decide for themselves how they wish to eat and I’d hate to come across as preachy; but I guess the blog is for anyone who wants to eat more vegetables and more food that is cooked from scratch. Sometimes the simplest of ingredients and cooking techniques can make the most delicious dishes and sometimes you want to make things a little more complex. Both ways of cooking have their place in my kitchen. How did you come up with the name The Honest Project? When I started the blog, it was so that I would have a project that I could focus on when I was recovering from being sick. I needed something to structure my day and I was so fatigued after chemotherapy I really saw the blog as a project to help get me back on my feet. I also wanted to write about things that were authentic and honest to me. I didn’t want to limit the blog to food related content so I thought The Honest Project was a good choice. Plus the URL was available, so didn’t have to think twice. What does your process from idea to finished recipe and blog post look like? It varies. I usually don’t put a whole lot of planning into my recipes. 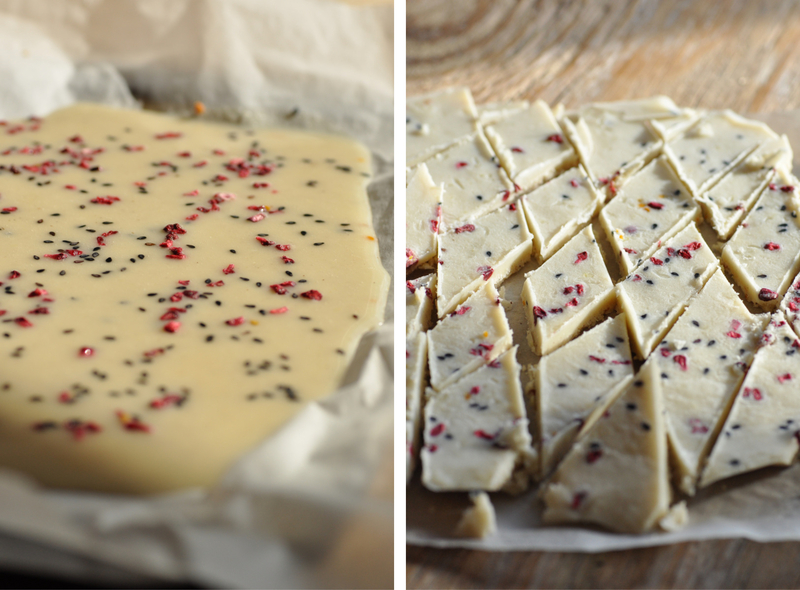 Rather I might have a beautiful seasonal ingredient in my kitchen and I decide to build a recipe around it. Sometimes I get ideas from café or restaurant menus from half way across the globe (thanks to Internet snopping) and I make an Honest Project version. Some of my favourite recipes have just come from me having very little ingredients in the kitchen and having to be creative with what I do have. I usually make the recipe a couple of times before it makes it to the blog. Also in the Winter time as day light hours are minimal, I have to make sure to make it early in the day so I have time to photograph it in natural light. I have so many ingredients in my pantry, it’s hard to narrow it down to five essentials. I always have olive oil (both extra virgin and olive oil). I love oats, they are so versatile and I use them all the time. I love avocados and literally have to stop myself eating them on repeat all day long. I eat a lot of nuts, especially almonds and cashew nuts and always have a supply in my handbag in case the dreaded hunger strikes. Lastly, I always have leafy greens for juicing, smoothies, salads and adding to stews and curries. 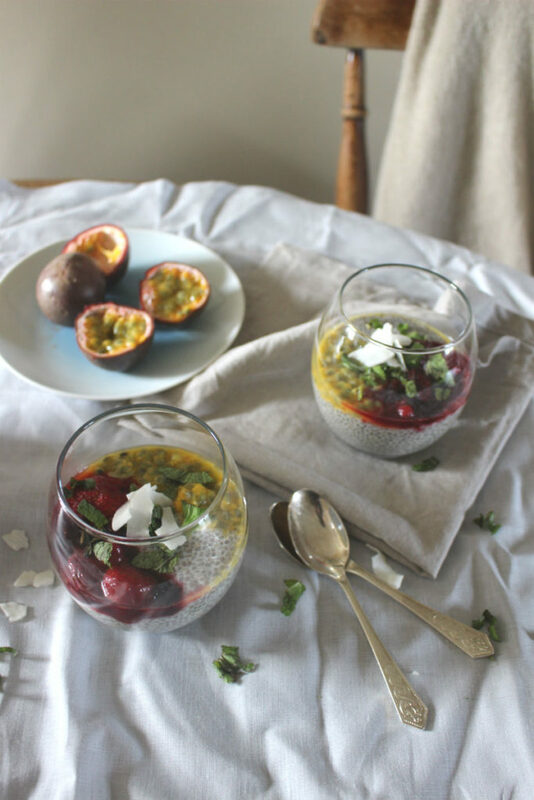 Today’s recipe is for Coconut Chia Pudding with Berries & Passion Fruit. Most of the time when I eat chia pudding for breakfast I skip adding any sweetener bar fruit. But for this recipe I add coconut sugar, so it’s really more suitable for dessert than breakfast. Let’s be honest, chia seeds don’t really taste like anything at all. 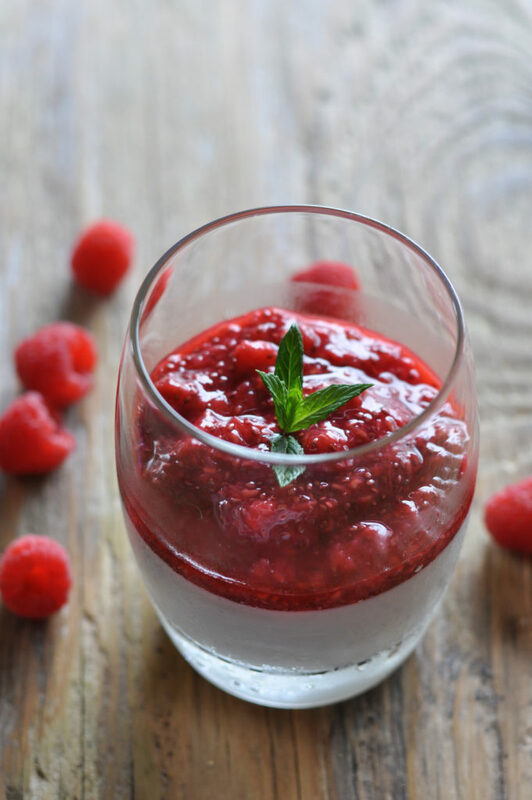 But paired with a delicious sweet nut milk and fresh berries, there are transformed into a delicious breakfast or in this case dessert. 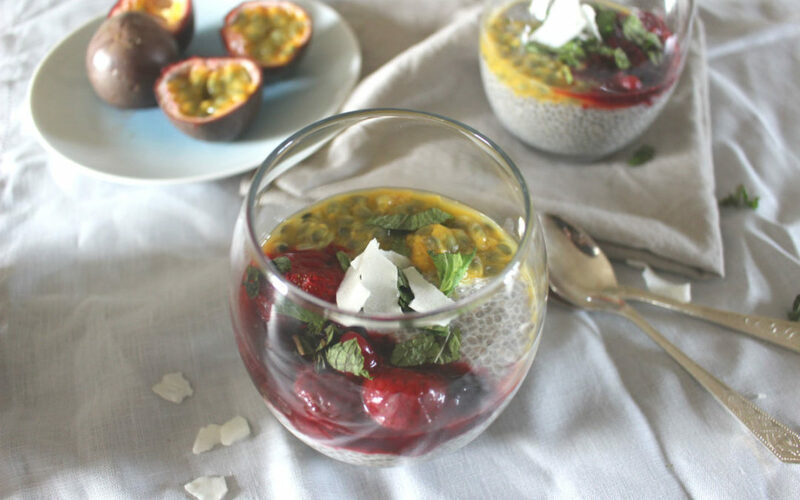 For this recipe I combine the coconut flavour of the chia pudding with passion fruit and berries. The great thing about this recipe is that it can be prepped in advance. 3-5 tbsp of coconut sugar (depending on your sweet tooth). Heat the coconut milk in a saucepan over a low heat. Add the vanilla extract and coconut sugar and stir until dissolved. Remove from the heat. Add the chia seeds to the milk mixture and stir well. Pour the mixture into a large container and place in the fridge for 4 hours to set. Just before serving, heat the berries in a saucepan over a low heat until they soften. 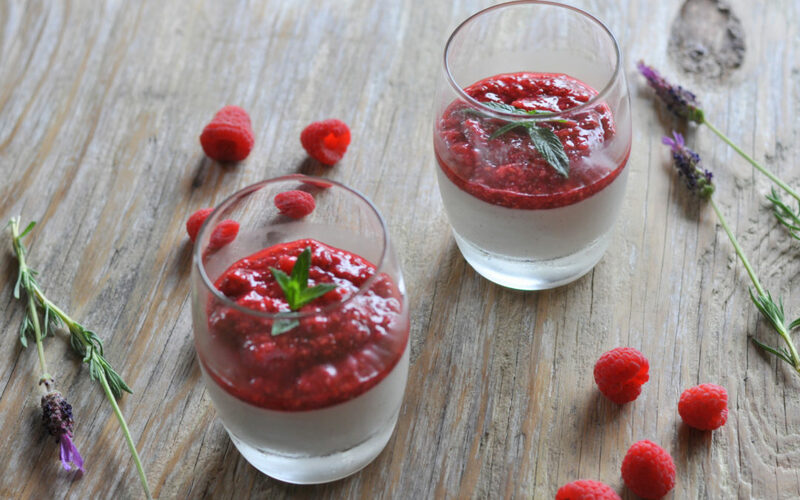 To serve, divide the chia pudding between six serving glasses. Spoon a tablespoon of berries and their syrup over each. Spoon the flesh of half a passion fruit into each glass. Top with fresh mint and coconut flakes. 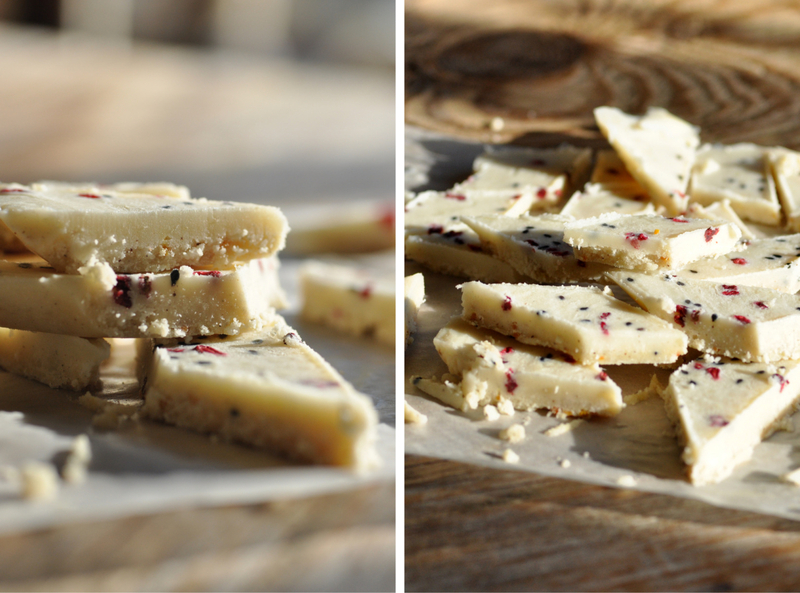 Head over to The Honest Project for more great recipes! And if you want to stay in touch and follow her blog on Social Media, you will find her on Facebook Here and on Instagram Here. It’s that time of the year again, when you get to indulge in making and giving, without anyone questioning it. Actually it seems much expected that you do so. In this time of “shoulds”, “musts” and “have-tos”, a midst overwhelm and busyness perhaps a desire to slow down and take time, doing what really matters instead, is what we are truly looking for? OK… So I do realise that it’s not everyone sees the kitchen as their creative playground (though this is surely all about perspective?!) 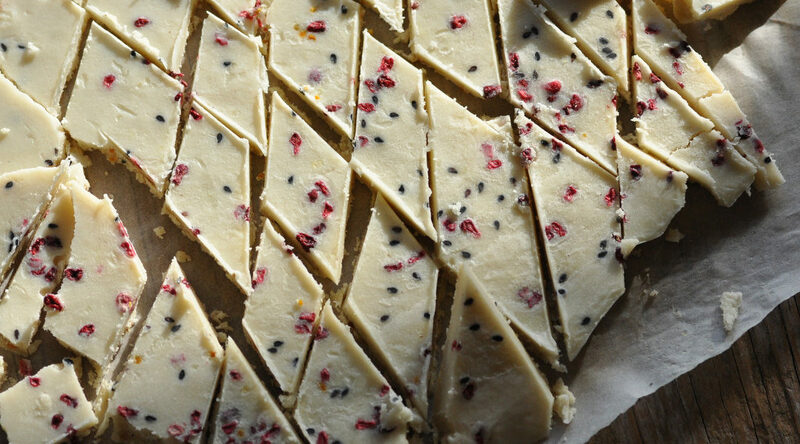 but for those of us who do like to play in the kitchen, making sweet or savoury treats, bakes or dishes that can double up as gifts is a win-win! And why not make a play date, not just for you and the kitchen, but invite a friend or two to come along too. The experience of cooking and eating is often elevated (in my experience) by sharing, so have fun. 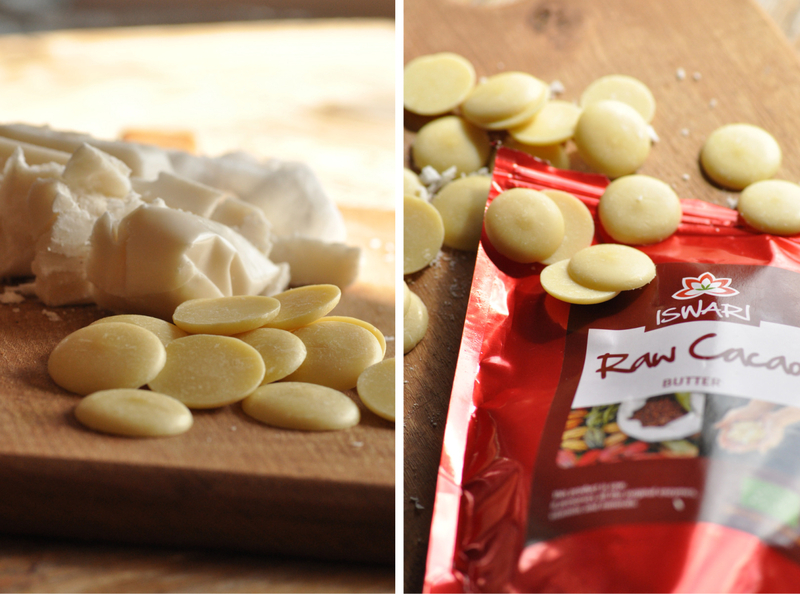 These raw chocolates are really quick and easy to make and only require five ingredients. You’ll have them whipped up in no time. Mint, chocolate and coconut is a classic combination, so if you know that you already like this combo, you will not be disappointed! Roughly chop the creamed coconut and melt it on low heat in a small saucepan. Creamed coconut is available in most healthfood shops and also in Asian grocery stores. It is dehydrated fresh meat of mature coconuts and solid at room temperature. Once the coconut is melted add the mint extract and then give it a good stir to make sure it is dispensed evenly. Add the melted coconut mix to the molds. Try to fill each mold to about ½. 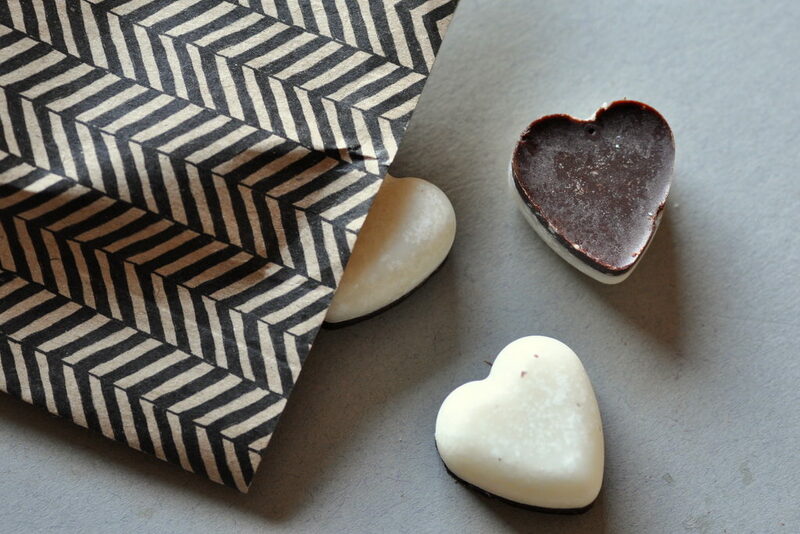 Place in the fridge to set, while you proceed to make the raw chocolate. Melt the cacao butter in a heat proof bowl on top of a saucepan with simmering water. Once the cacao butter has fully melted, add the cacao powder and then mix until you have a smooth blend. And the maple syrup and mix again until your chocolate mix is again lovely and smooth. Remove your mold tray from the fridge and spoon the chocolate mix on top of the coconut mix. Place the tray back in the fridge and let the chocolate set. This will take a few hours. Once your chocolate has hardened, pop them out of the moulds and place in an airtight container in the fridge until you want to serve them. Or gift them! 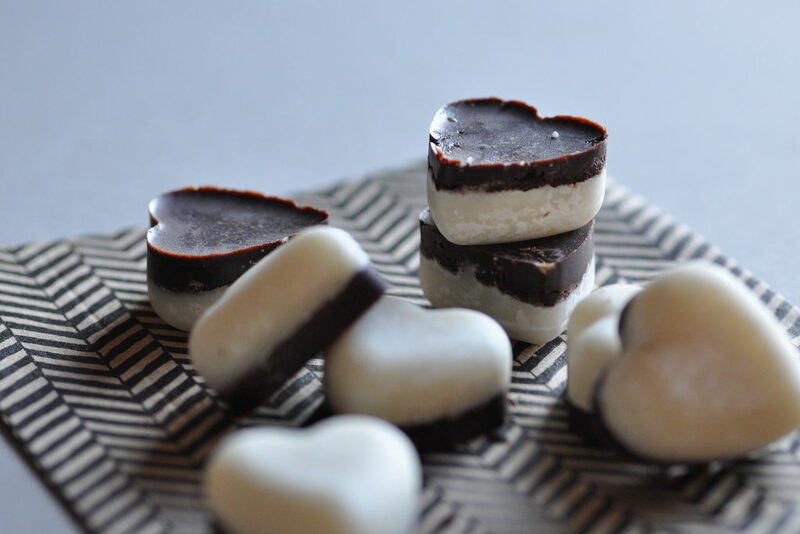 ***I use silicone ice cube molds to make these and it makes the process very easy. 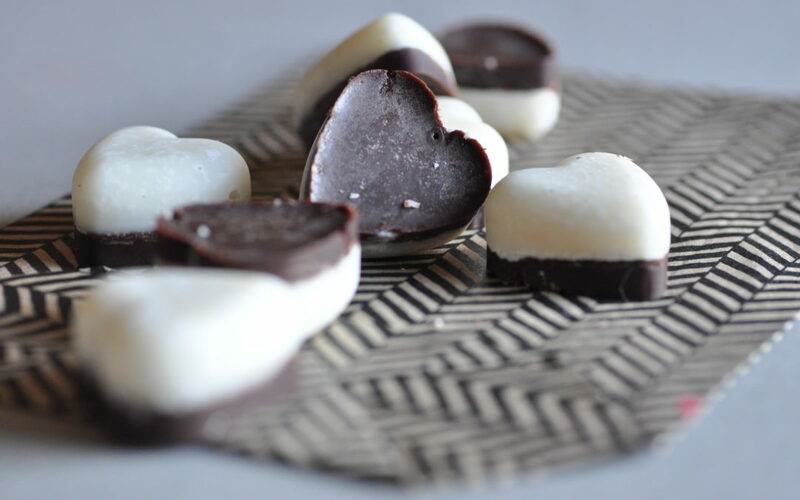 You can use any shapes you like of course and if you don’t have a mold, then you can try simply pouring the coconut layer out first on a lined tray and once set, add the raw chocolate layer. I haven’t actually tried that technique with this particular recipe, but I don’t see why it wouldn’t work. I’ve been wanting to share this recipe for the longest time ever! And I’ve also wanted to share a red cabbage recipe here forever… The funny thing is when you do food blogging though is that there’s so much timing involved. At least if you are trying to keep things somewhat seasonal. This means that sometimes I don’t get to act on the ideas I get, or end up trying things, even shooting the recipe and then never getting around to publish it, because life gets in the way or perhaps I’m not organised enough. Or maybe it is a combination of both??!! 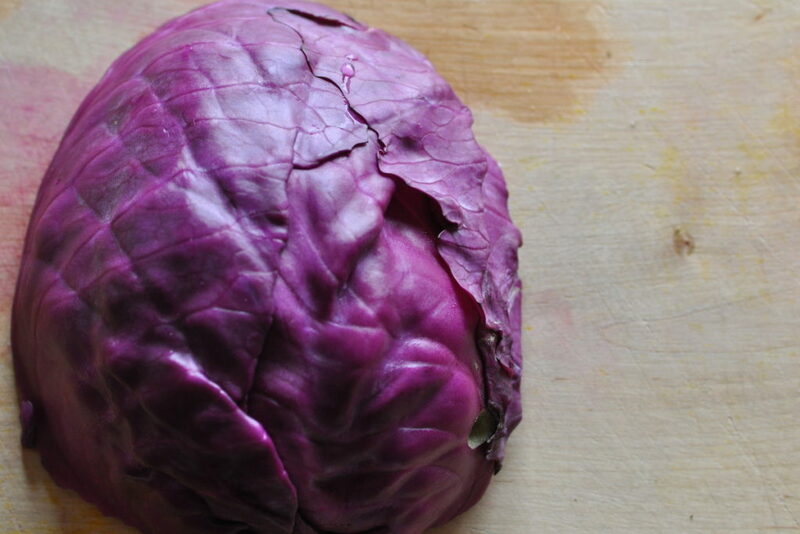 I don’t know when my love affair with red cabbage started, but somewhere along the way it did. Now, for me it is a seasonal vegetable and one I tend to mostly enjoy Autumn – Winter – early Spring time. I’ve never tried growing it myself for I think three reasons. One, I don’t have much space and each head takes up a lot of space. Two, they take ages to grow (and that’s hard if you are low on patience). And three, every year around this time we seem to get an infestation of little butterfly larveas that eat anything that belongs to the cabbage family. At the moment it’s particularly bad and they’ve eaten a lot of my precious kale. So if you happen to have some tips on how I can kindly ask them to go and snack else where, please share! This recipe may sound like an unlikely combination but it actually covers all the different taste elements in one bowl and it’s also a visual delight! Apparently most people don’t eat enough of blue / purple foods and in this bowl you get two different types straight up. Blueberries are tasty little nutritional power-houses. Their blue plant power comes from the phytonutrient anthocyanins which have been shown to improve both memory and eyesight. They are of course delicious on their own as a simple snack, perhaps paired with a few walnuts for extra brain power potential, or on top of the morning smoothie / porridge / granola. Or you can be a little bit more “out there” and add them in a salad like I’ve done here. 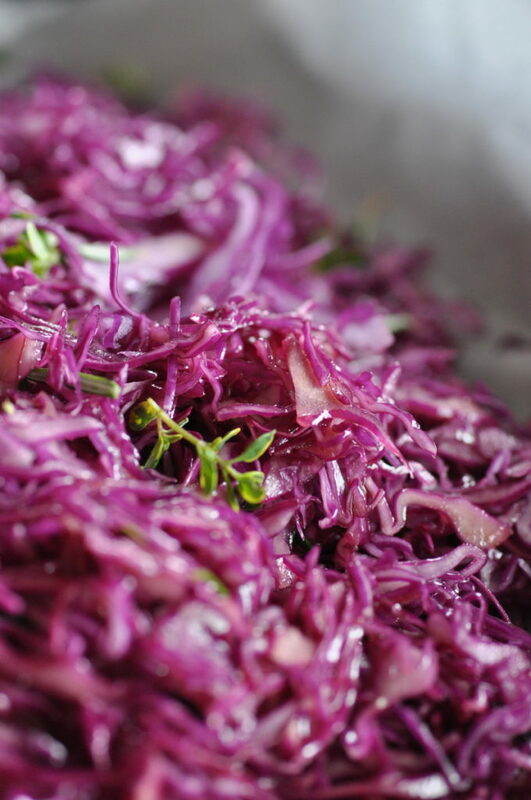 Red Cabbage is one of my favourite winter vegetables. (Ok, ok, I hear you it’s still summer!) It reminds me of Christmas in Sweden and having cooked red cabbage with the Christmas ham. One of the first natural healing remedies a learnt about in college was the healing power of cabbage juice for stomach ulcers as it is rich in the amino acid glutamine as well as the cancer protective phytonutrient indole-3-carbinole. Cabbage is also rich in vitamin C, potassium, vitamin B6 (important for a well functioning nervous system), calcium, magnesium and manganese. Savoy cabbage, the beautiful green leafy head one, is very popular here in Ireland and a staple part of the national dish “Bacon & Cabbage”. I will admit that it has taken me some time to really get into the swing of cabbage love, but just as with beetroot, I’m a total convert these days. If not just for the great health benefits it brings, but for the beauty if the colour alone! You can keep this salad entirely raw if you like, but personally I prefer red cabbage cooked hence I am doing it here. However with this salad the finely shredded cabbage is cooked in the oven for just 15 min so it is more heated through than “cooked”. It does soften in and takes away that “rawness” that I’m not super fond of. But do as you please, this recipe is flexible enough to make sure this seemingly odd combination will still work for you! Heat the oven to 180°C. Remove any damaged outer leaves of the head of cabbage. The shred it finely. I prefer using a cheese slicer, but if you don’t have one of those you can use a mandolin. If using a mandolin you may need to cut the cabbage into wedges. The trick is to get it as shredded as finely as possible as it makes for a much nicer texture, in my opinion at least! 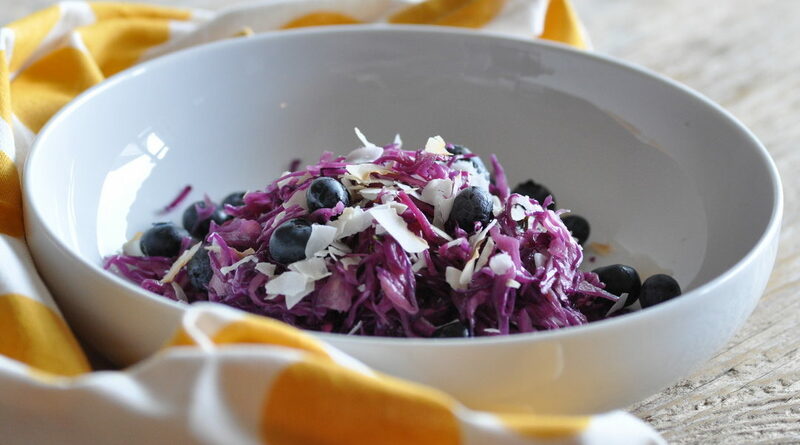 Place the shredded cabbage in a bowl and add the olive oil. Gently massage the oil into the cabbage with your hands with some kind squeezes. Then place the cabbage on a baking tray. Scatter it out evenly and then add the rosemary and lemon thyme (if using). Bake in the oven for about 15 min until warmed through and soft. Make sure you toss it about a few times in between to ensure even roasting. *Note* If you want to make this salad entirely raw, then skip the oven step. 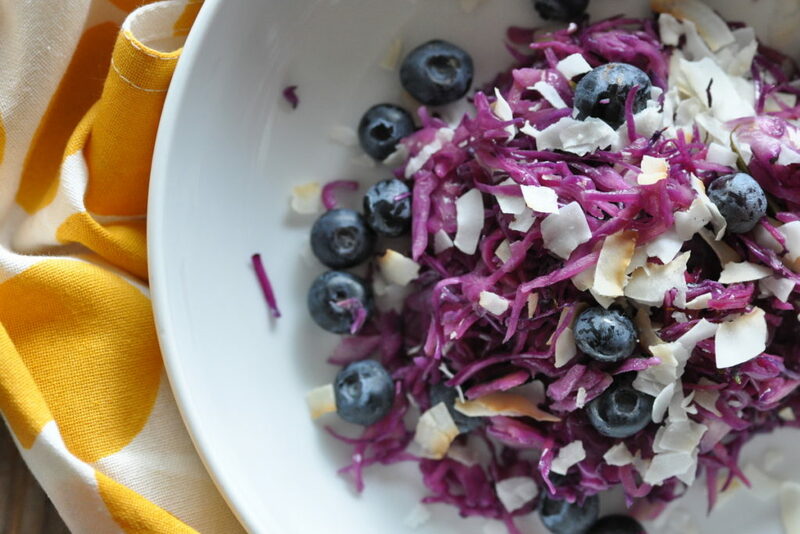 Once cooked, place the warm cabbage in a serving dish, drizzle some balsamic vinegar over it, add the blueberries and the coconut flakes. Serve, enjoy, and give your brain a boost at the same time! Want to add more colour to your life and plate? Download the Rainbow Bowl Ebook and get creative!